I can’t remember the reason why now, but I’ve ended up looking at Tim Follin’s Atari ST sound driver and reverse-engineering it. I’m convinced many people have been down this path before, but I did it just because it interested me. To do the analysis, I’ve been using the version of the driver from LED Storm, originally ripped for the SNDH archive by Grazey/PHF. Many thanks to him! The disassembled code was quite easy to work out and annotate. You can find my documented and buildable version of the driver at https://github.com/tattlemuss/folly. There are a few interesting things to say about this driver, but what strikes me the most is how primitive it is in some ways, and sophisticated in others. The use of envelopes and pitch modifications is very simple, for example. There is no use of the buzzer. The drum sounds are very basic. If you compare it to a modern YM driver tune by someone like Tao, for example, it’s clearly from a different era. But I love its melodic feel. The ability to write a direct value to a YM register, used for enabling and controlling noise. That’s more or less it. It’s very simple. This is not a criticism; the state-of-the-art in terms of pushing the hardware was still in its infancy. Indeed, it’s amazing what can be produced by so little. The routine updates the YM chip at a rate of 50Hz (one PAL vblank). That was the standard interval for ST music at the time. Modern routines often update of a rate of up to 200Hz, taking more processor time. This routine usually runs in about 10 scanlines, or 5000 cycles — roughly 1/30 of the available processor time in a vblank. What’s more interesting is the sequencing and programmatic arrangement of the tracks. A lot of chiptune music is done in the “tracker” paradigm: you get a palette of “instruments” you can define, then you can design “patterns” of say 64 steps, inserting notes into the pattern’s grid at given steps. Then there are fixed commands you can have on each step to modify the sound. For example you can change volume or set an arpeggio per step. This driver isn’t like that; each channel is a standalone sequence of “commands”, where a command can be a note, or any number of modifiers or sequencing steps. There is no concept of “instrument”; envelope, arpeggio, slide etc can be set independently of each other, and several can be changed at the same step. More powerfully there is flow control: you can loop a sequence, and even have a stack of “subroutines” to reuse common sequences and return back after completion. Since all channels run independently, they can be running overlapping stacks of sequences. You’ll see a couple of examples of this below. If this is a bit too involved, skip down to the “Visualising” part. Start a loop from this point. Loops are not stacked. Decrement counter and if not zero, go back to loop point. following notes have an extra byte with the note's duration. Pop the return address off the stack and continue processing from the popped address. Next byte: number of semitones to transpose all following notes. Signed 8-bit value. Write a value directly to the YM registers. This is often used to write noise pitch. so the driver ensures that only the bits relevant to the active channel are set and cleared. Next byte: if zero, moving to a new note does not reset ADSR, otherwise ADSR is reset. Sets the semitone note offset of the arpeggio and the times they are held for. Set the number of semitones to jump per update when applying glissando between notes. Set the delay, size, speed and starting direction of the vibrato effect. or turn it off by using a single zero-byte. Jump to a new offset. Used for the infinite looping of tunes. Turn the channel off after N more updates. Once we’ve worked out the format of the data, we can do some more interesting things with it. Here’s an example, the commands where there is a bassline and drum sounds are playing on the same channel. My annotations are lines beginning with ”#”. Ultimately, all of the tunes are constructed in this way, using repeated building blocks and modifiers placed around them. It’s a very programmatic approach. I am assuming the tunes were written in a code editor, since creating a UI for this would be very time-consuming. Often this is much clearer to understand using the graphical visualisation. The image below is a representation of LED Storm’s main tune (the one I linked to above). 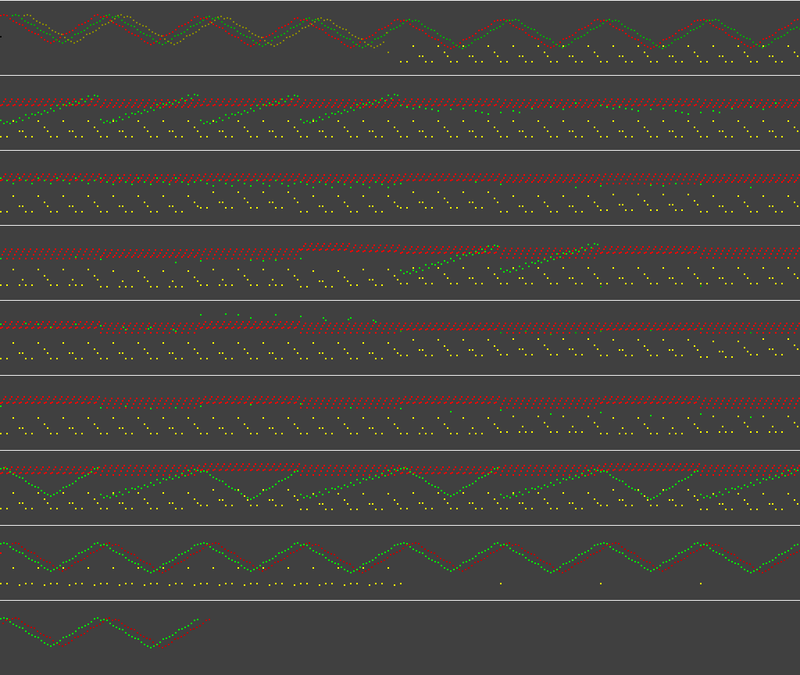 Each channel (A/B/C) in the tune is coloured (red/green/yellow). Read the lines across in rows to follow time. The green channel ends up as the main melody, yellow the bass and drums, red the “fill” arpeggios. Darker colouration is a simple attempt to represent the envelope volume. In this example the “up and down” scales at the start of this tune are the same sequenced subroutine on each channel, but delayed and with several different note transpositions and envelopes applied. In fact almost anything that looks repetitive in the image is a shared subroutine. See if you can follow the notes while listening to the MP3 recording again. The code itself is pretty straightforward and is contained in LEDSTOR2.S. I have documented it fairly thoroughly and used defines to make the data offsets more readable. There are a couple of routines for initialisation of either a tune or a sound effect, and the main update function is marked as “follin_update”. Its job is to run through for each channel, updating the shape of the active note and potentially running through commands before looping to the next channel. One very strange thing is that all data offsets, from the start of the tune data, are little-endian, even though the 68000 is big-endian. I suspect that is because the tune is orignally composed on a different machine (possibly the Spectrum) and it was more convenient to use that. Again, I suspect this is because the code is a port, and it’s simpler to maintain code over multiple platforms, if you keep them similar. Also the musicians of the 1980s were knocking out a lot of stuff very fast; they didn’t have time for multiple rewrites! Anyway, feel free to use this information however you want. Theoretically it’s now possible to write your own tunes with Tim’s driver, or optimise the player. Have fun!